If an oval diamond is what makes your heart sing, look no further. 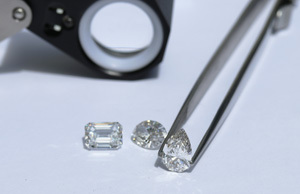 Ada Diamonds specializes in large, sensational laboratory grown oval diamonds. As the leading purveyor of luxury bridal featuring lab created diamonds, Ada Diamonds has unique access to the best of the best manmade diamonds available. Many oval diamonds have a visible "bow-tie" effect, in essence a shadow spanning the width of the diamond. Ada's Concierge team carefully hand selects and visually inspects each diamond to ensure our ovals are eye clean with no bow tie effect. When selecting your lab created oval diamond, your Diamond Concierge will help you find the perfect length and width ratio for your engagement ring, and will carefully curate a list of only the most exceptional lab grown ovals to meet your specifications. A classic solitaire setting featuring a lab grown oval diamond center stone. The past, present, and future, represented in one gorgeous ring. Ada's cultured diamonds are chemically and optically identical to naturally mined diamonds. Lab diamonds typically cost 30-40% less than equivalent quality mined diamonds and have a known, sustainable, conflict-free origin. Want to upgrade to a bigger, brighter diamond? Want to add another band for an anniversary or birthday? Learn more about Ada's upgrading, restoration, and replication services. In addition to stunning, one-of-a-kind custom oval engagement rings, we would be happy to create a stunning bridal set featuring wedding bands from simple to luxurious. A favorite of celebrities such as Blake Lively and Miranda Kerr, lab created oval diamonds are one of Ada's most requested diamond shapes and are one of our specialties. These stunning diamonds are cut in a similar fashion to round brilliants and offer extraordinary sparkle and a unique, finger flattering shape. Your Ada Concierge will help you design the perfect setting for a modern and sophisticated engagement ring you'll love forever.